Nestled in the heart of Jackson, BRAVO! 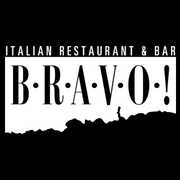 has proudly served delicious Italian food in a relaxed and welcoming atmosphere since 1994. Everyday, our passionate chefs work with the best raw ingredients in order to serve you hearty and flavorful dishes, from gourmet pastas and wood-fired pizzas to mouth-watering steaks. With 20+ years of Wine Spectator awards, our wines are just as good as our food, and you will always be served with warmth and grace by our knowledgeable staff.